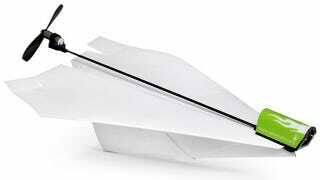 Paper airplanes have been a staple of the student arsenal since they phased out slateboards and papyrus scrolls. The new PowerUp electric paper airplane engine turns docile handmade gliders into propeller-driven ATT (air-to-teacher) missiles. The $20 PowerUp by Tailor Toys, consists of a tiny propeller on a tiny motor attached to an equally tiny battery by a carbon fiber twig. It may not look like much, but this contraption can power a plane for 1.5 minutes off of a 20 second charge (just don't exceed 20 seconds or you'll blow the capacitor). Unfortunately, the charger itself doesn't come with a rechargeable battery pack; it doesn't even include the three AAAs it requires. Don't expect to find a premade airplane in there either. If for some reason, you managed to live through your depraved childhood without learning how to fold airplanes, watch and learn on the Tailor Toys website. You can keep up with Michael Zhao, the author of this post, on Twitter.